A good mounting block is a useful tool, but they're so expensive in the catalogs. 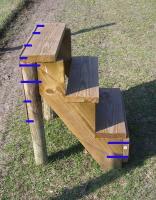 Here's a tall 3-step mounting block that I made for less than $20, with a description of how I made it. It is *not* light but it is tall and it is very sturdy. Click any picture on this page to see a larger-sized image. Using a mounting block helps in many ways. For one, it's just easier to get on the horse. For two, it's better for your horse's back: grabbing the saddle and pulling yourself up yanks the saddle a little sideways on the horse's back. Even if the saddle doesn't slide, it still digs into the horse's back on the far side. For three, pulling that hard on your saddle places a lot of pressure on the tree. One of the fastest ways to end up with a twisted tree is to mount solely from the ground, from one side. 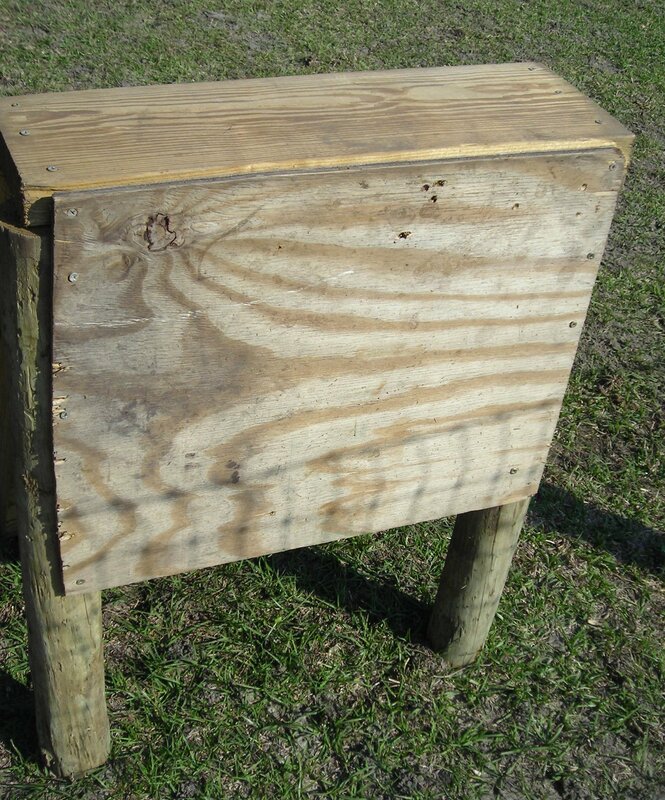 Even when using a mounting block, it helps to mount from left and right, alternating each time you ride. 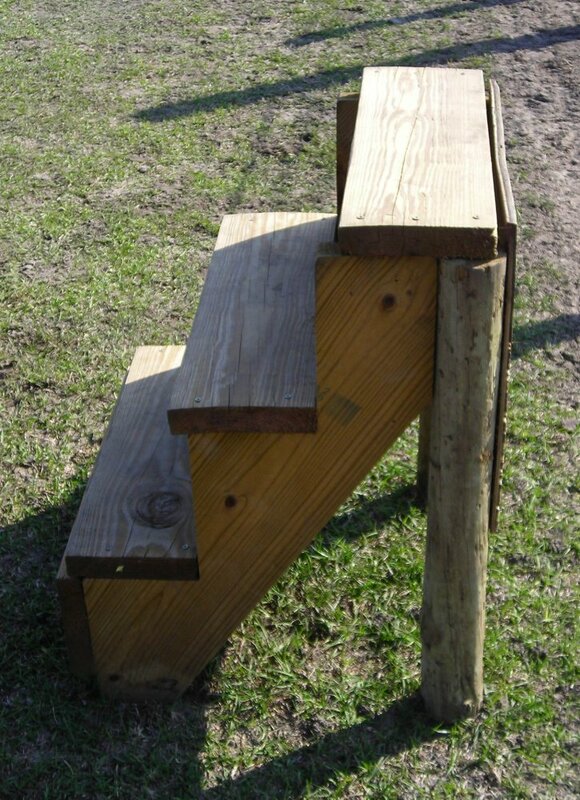 ~ The sides are "stringers," used to make staircases. They come pre-made and if I recall correctly they were $7 each or so (at Home Depot). The steps are 2"x8" boards; I got one 10' board and I think it was $5 or so. ~ It's 2' wide, using four 2' pieces of 2"x8" (3 steps and a brace across the base of the steps). ~ There are 2 screws on each side of each step securing it in place. ~ The top step is screwed into both the stringer and the post from above, 3 screws on each side. ~ I used leftover fence posts as supports, but you could just as easily use more 2"x8". 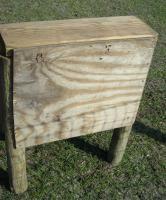 ~ There is plywood (2' wide, goes from top to 2' down) across the tall side as a brace, but again you could use boards. ~ At the top, there are long screws going from the back through the plywood, through the post, and into the stringer. ~ Further down the plywood is screwed directly into the post. 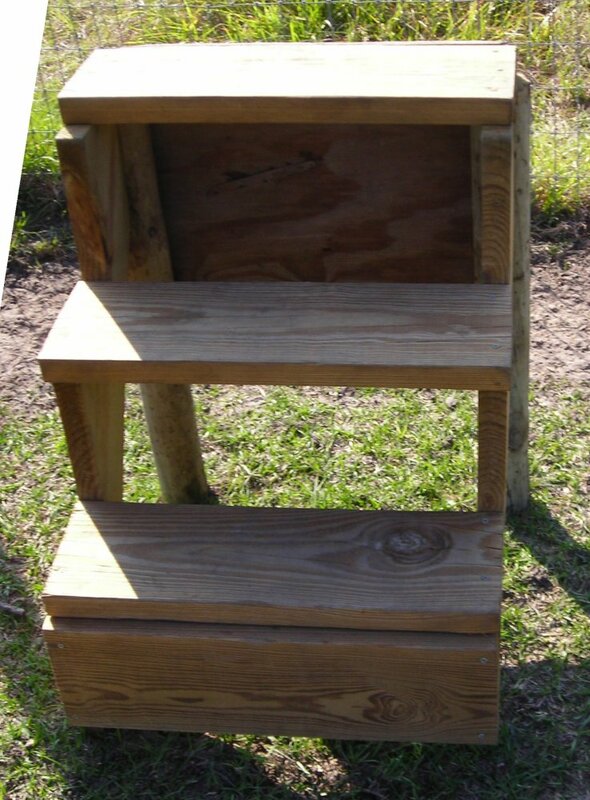 ~ The plywood is also screwed into the back of the top step. I took the "stringer" and put the steps on upside down from the way it's intended to be used. I got a taller set of stairs that way. 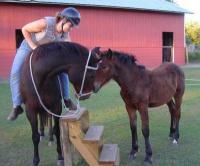 My horses are tall, and I had back surgery last year; I don't have much spring in my lower back anymore. I really like being able to just "step" onto their backs. © 2006 Galadriel Billington. All rights reserved.